Wixom, MI — Trijicon has combined the legendary toughness and function of its combat-proven ACOG and associated ballistic reticles with a new variable optic. The new Trijicon VCOG (Variable Combat Optical Gunsight) 1-6×24 mm meets the rigorous demands of duty or competition while giving shooters the flexibility to engage CQB targets and out to the maximum effective range of most service rifles. Designed and built in the USA, the Trijicon VCOG is machined from a 7075-T6 aluminum forging and given a Mil Spec, hard-coat anodized finish. There is a full 90 MOA of windage and elevation adjustment available in ½in / click increments @100m to get almost any weapon system on target. Lenses are all fully multicoated with a broadband anti-reflective coating that maximizes light transmission while meeting and beating the military’s requirements for abrasion resistance. 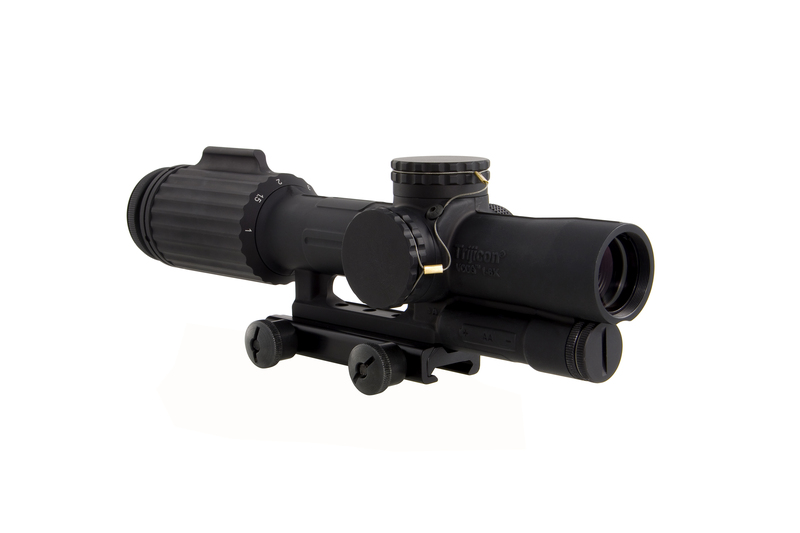 The scope maintains a constant four inches of eye relief throughout its magnification range and an oversized and knurled adjustment knob makes finding the perfect power setting easy and fast, even with gloved hands. Before its debut, the VCOG underwent rigorous shock and vibration testing to assure it met the standards of a Trijicon brand optic. The VCOG is waterproof to 66 feet and its illumination electronics are Mil Spec tough. Extra-thick tube walls give the VCOG a toughness advantage over its more fragile competitors. Also tested for smoothness and long-term durability, was the optic’s magnification system—the VCOG offers shooters an outstanding service life under the most rigorous conditions. Initially, the VCOG will be offered with seven different reticle choices, all of which are located in the first focal plane allowing the ballistic reticle to be used at any magnification. 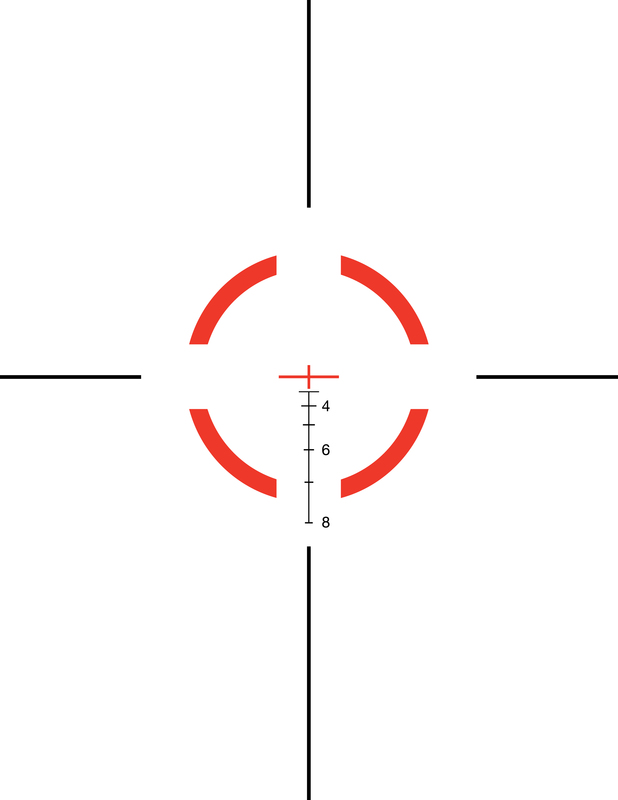 The segmented circle reticle with a centered crosshair can be matched with 175-grain 7.62, 55- and 77-grain 5.56, or 115-grain supersonic 300 BLK loads. The popular horseshoe/dot reticle is available in each of the 5.56 and 7.62 offerings. The red illuminated reticle is powered by a common AA battery, accessible underneath the objective, delivering 700 continuous hours of runtime at setting 4 of 6 with a lithium battery. A rheostat is located on the main tube, opposite the windage turret, and has an off position between each of its six brightness settings. An integral mount securely pairs the optic with any M1913 Picatinny rail and its height is perfect for flattop M-16, M4, AR-15 and SR-25/AR-10-style rifles. Two slotted screws secure the optic to the rail. At just 10 inches, the VCOG leaves plenty of rail space ahead of the objective for night vision or thermal intensifiers. Trijicon’s ACOG and ballistic reticles are the most battle-proven, magnified-optic systems in the world. The new 1-6×24 mm VCOG adds tremendous flexibility into the mix while maintaining Trijicon’s high standards of ruggedness. With one optic, operators, law enforcement officers and competitors can engage CQB-distance targets at 1X or roll up to 6X and engage long-distance targets with confidence and precision. The Trijicon VCOG is slated to begin shipping to authorized Trijicon dealers on or about August 1, 2013. For more information on the Trijicon VCOG and the complete array of Brilliant Aiming Solutions™ for the military and law enforcement markets, contact Trijicon®, Inc. at (248) 960-7700 or visit www.trijicon.com.